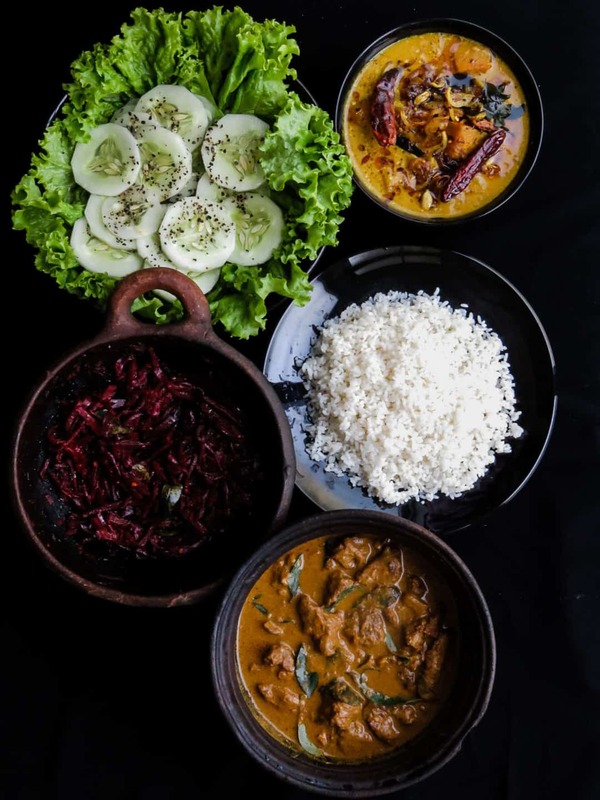 Sri Lankan Lunch meal plan 1- rice, mildly spiced beetroot curry, slow cooked beef just like my grandmother used to make, pumpkin curry cooked in coconut milk, a few slices of Cucumber in a bed of lettuce leaves. I’ve been playing around with this idea of Sri Lankan meal plans for a few months now and if you go back to my earlier post or type lunch bowls on the search bar, you’ll find a few of my earlier creations. The idea behind Sri Lankan lunch bowls was just a way of listing dishes that compliment each other and helping me to keep a regular posting schedule. Well, it didn’t take me long to realize that I needed to add more recipes first before creating bowls of Sri Lankan meals. I stopped the theme and concentrated more on adding recipes. Now, I have a list of Sri Lankan recipes to work with and a lot more to come, I’ve decided to do the meal plans but instead of them in bowls, they are going to be detailed with links to the recipe I’ve used. These meal plans are based on my initial idea, our typical Sri Lankan meals can run from three, four, five and even seven dishes a meal. if you are not familiar with a Sri Lankan meal, you might find it intimidating creating all those dishes but they are not. Rice will always be the preferred carb and can be your regular rice, basmati for festive occasions and red rice. There will be a milk curry, which can have a heavy base of coconut milk, turmeric and mildly spiced. A dry stir-fry(for want of a better word)which in Sinhalese is called”thelata” that can be vegetables cooked in oil and semi-fried, this dish can be spicy sometimes. These are the basics that complete a Sri Lankan food table. So come join me, let’s have lunch together or let me at least help you with a few ideas you can work with, my Sri Lankan meals might not be too elaborate as my guests are usually kids and teens who as entertaining, they can be a boring lot to cook, send me a few of your favorite meal ideas you want me to try and I’ll try my very best to include them here. How to prepare and cook your first Sri Lankan menu. 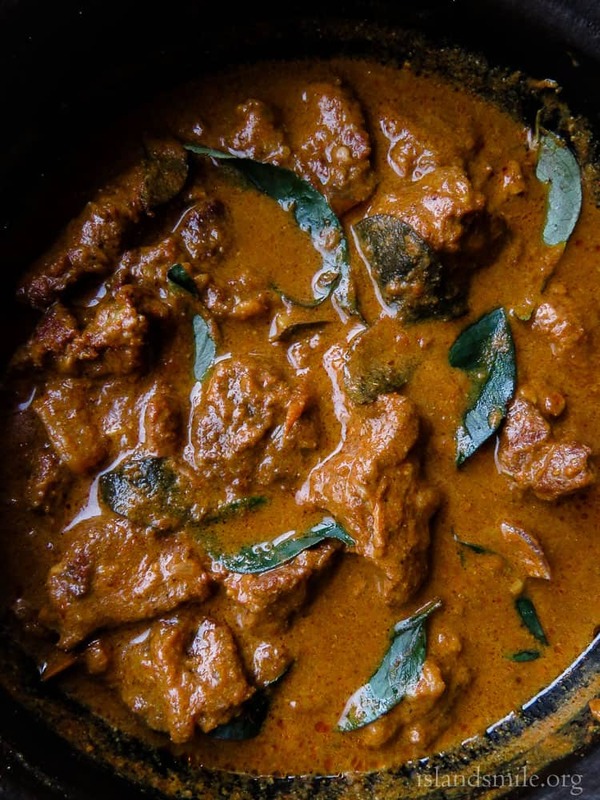 Start with the dish that takes longer to cook, in this case, it would be the slow cooked beef curry. While the Beef curry simmers, you can begin with the Pumpkin curry. 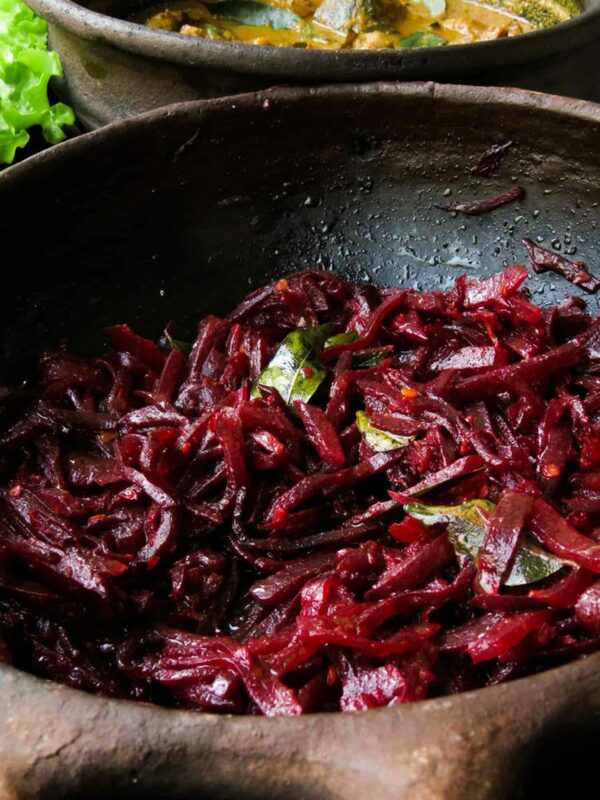 Assuming you have a double stove, while the other two curries are cooking, start with the beetroot curry. The recipe includes a kid-friendly version I used to make when the kids were younger, move down on the post and you’ll find the updated recipe. I find myself using the grater to shred the beetroot sometimes as it reduces time and energy cutting the beetroot into slightly thick strips. In between making the curries, you’ll be able to get the rice cooking. I’m currently working on an ultimate guide on how to cook rice and they include a few methods you can try, in case your pressure cooker fails you. The post will also include the quantity of rice for servings, once I’m done with it, I’ll link the post here. You need something fresh and raw to compliment your other cooked Sri Lankan dishes, so I opted on slicing a few cucumbers, placing them on a bed of lettuce leaves and then sprinkle with salt and pepper. I prefer to do this last as cucumbers kept out long, let’s out water. Well, that’s it for my first Sri Lankan meal plan, let me know what other dishes you would add to this menu, I’ll be happy to hear from you about your favorite menu to serve family and guests. Send me an email or contact me through my social media profiles and I’ll try to recreate your menu. I would like to subscribe. Grateful for the information. How many servings does this menu make? A family of 5 adults is my audience. This would roughly serve three adults. It all depends on if your audience is single serving or two serves. I would recommend cooking extra than less. Rice 3-4 cups which can yield enough cooked rice for 5 with anyone who wants to double serve. Slow cooked beef-the recipe given is for 500g of beef, you can double the recipe ingredient and cook for 1kg, should be adequate. Pumpkin curry recipe is for 500g, so you should be fine for 5 people. Beetroot recipe is for 250g double the recipe to 500g. As I mentioned earlier it all depends on how your audience of 5 eats, light or heavy. I hope this information helps. let me know if you need more details. There is a box to subscribe in the sidebar for you to do it.